OCREP is proud of its partner agencies and collaborations and the work they do every day within the local community. From time to time our partner agencies have the opportunity to feature specific stories at events or in published materials. These stories provide a glimpse of the transformations we see every day and we hope you enjoy learning more about these individuals. Congratulations to the 2016 Project Kinship Leadership Academy Graduates! You are truly an inspiration and testimony of transformation. 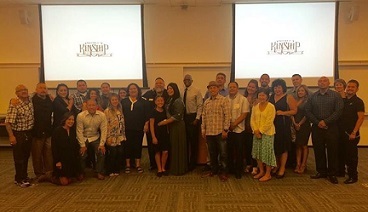 Project Kinship graduated 15 formerly incarcerated individuals from their program last week! These graduates will serve as mentors to recently released individuals, work on community education and outreach including 12 legal prop 47 clinics, and advocating for needs. We look forward to hearing about more of your successes and best of luck! Melissa signed up for Onesimus' new Celebrate Freedom Re-Entry Classes, when they first started a few months ago. While in the class she also asked for a mentor, who connected with her through letters the whole time, and will continue with her for at least six months when she is released. Melissa was inspired and encouraged by the class and completed all her lessons, worksheets and homework preparing her for her release. When that day came she had a plan, and the very next day, entered a treatment program, all the while in contact with her mentor, Ruthie. 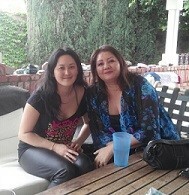 She is currently doing well in her program and working with her mentor. Melissa is a great example of our motto, which is "Setting Goals, Having a plan, Building a life, Beyond incarceration". Hope Builders is a nationally-recognized workforce development program that empowers disconnected young people (ages 18-28) who are in danger of not reaching their full potential through skill training in construction, business and medical careers as well as ongoing life skills development. 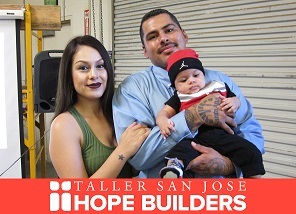 Hope Builders youth come from challenging backgroundsthey are low-income, unemployed or underemployed, and undereducated and may have been impacted by violence, are pregnant and/or parenting, or have a criminal background. Each training program lasts 16-20 weeks, with an additional two years of employment retention support. Hope Builders gives youth, like Ernie, a second chance. Ernie applied to Hope Builders in early 2015. Ernie started making bad choices at an early age, got caught up with drugs in high school and landed in jail at 21 years old. Ernie was arrested a few weeks before his first daughter was born and was sentenced to seven years in prison. When Ernie was released from prison at 28 years old, he knew he had just one last chance. Ernie just completed Hope Builders construction program in November. Because of his determination and hard-work, Ernie was hired by Hope Builders Construction Company, the agencys social enterprise and general contracting company. He now makes enough to provide for his family, and is a good example for his daughter. Early this year, Hope Builders expanded beyond its 20-year Santa Ana headquarters with a second training center in Anaheim offering 10,000 square feet of additional space for onsite construction and medical vocational instruction, with plans to add another training track by 2018. Within three years, the organization plans to double its services to more than 700 local youth annually. If you are interested in hiring a Hope Builders graduate or you would like to get involved, please call (714) 543-5105 or go to www.tsjhopebuilders.org. 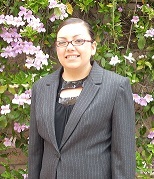 The BI Santa Ana Day Reporting Center hosted their first Dress For Success motivational speaker luncheon. This event was put together by our Job Developer and staff to motivate those participants who are seeking employment to dress for success as they begin their quest to secure employment opportunities. Eight participants consisting of men & women were taken to Ross Dress for Less to select appropriate clothing for job searching & interviews. Everyone did an awesome job with selecting clothing and asking the BI staff for assistance with making appropriate selections. The participants were asked to participate in taking before and after pictures to show their transformation from casual dress to dressing for success, we even had a tie tying session hosted by one of our DRC Client services specialist; this was awesome as most of the guys had never tied a tie. We then opened the floor with asking questions on their view of what dressing for success means to them, and how they feel about their professional transformations, everyone stated they were excited, felt very good, confident and were ready to take interviews by storms. We had the pleasure of having a motivational speaker tell his story to the group on how he overcame obstacles from being incarcerated, released and hitting the ground running to eventually securing and maintain a successful career as an operations manager for Wal-Mart. Everyone was very attentive, and asked multiple questions after the speaker concluded his speech. The event ended with a great lunch from Subway where everyone was able to sit down eat a great lunch, socialize, and thank the guest speaker for his motivation, encouragement, and sharing his story which definitely let us all know were capable of being successful against all odds, we just have to stay focused and keep our eye on the prize which is ourselves. BI staff is already being asked when is the next dress for success event, and also praised those who participated on how great and professional they looked. On August 8, 2015, the Santa Ana Day Reporting Center took the challenge to participate in their first Adopt-A-Highway project. This project will be held every second and fourth Saturday of each month. This will give the opportunity for participants of the DRC to volunteer. 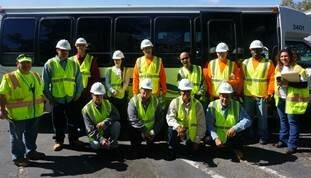 All ten participants completed a training orientation that provided detailed safety procedures. The participants were provided with proper clothing, shoes, and their safety equipment. The Santa Ana DRC is excited to continue this project and help each participant reintegrate to society by learning new skills and getting the chance to give back to their community. When Cynthia was 14, she became heavily involved in illicit drugs until the age of 18. She entered three different rehabilitation programs but nothing seemed to stick. Cynthia's young life involved living the street life, leaving home for weeks at a time and eventually dropping out of school to hang out with her friends and do drugs. After a move to Utah proved to be unproductive for her, she ended up moving back to California where she started hanging out with gangs, and eventually found herself in and out of jail for two years. When she was released in 2008, she decided enough was enough and that she needed to make a change. She ended up meeting her husband, who was not part of her normal lifestyle, and about six months into the relationship, they got pregnant. When her probation officer found out, she warned Cynthia that if she tested dirty for ANYTHING she would send her upstate. Unfortunately, that still did not stop her and she continued to use until she was 2 months pregnant. Her Probation Officer gave her one last chance and it was to go to rehab. In the program, she soon began to change her attitude and disassociate with anyone and anything that had to do with her past. After she had her two daughters, she wanted to go back to work and applied at every place possible. Due to her criminal history, not even McDonalds would hire her. She felt hopeless and ashamed. She wanted to change her life, but her past kept resurfacing and getting in the way. Finally, she learned of a program called Taller San Jose (TSJ) in Santa Ana where she completed their Office Careers training program and became certified in Microsoft Word and Excel. Aside from the workforce training taught, Cynthia participated in Life Skills courses where she learned to mend her broken marriage and Job Readiness courses to prepare her for the professional world. She remembers initially walking into TSJ with her head down and feeling ashamed of herself and who she was. After being a high school drop-out, she ended up graduating from TSJ at the top of her class, which was a huge accomplishment. Upon completion of the program, she accepted a short-term internship with St Joseph Health System which turned into a permanent position as an Administrative Coordinator. She is now working full time and also co-enrolled at National American University where she is striving to pass all of her classes with a 4.0 GPA. She hopes to one day be a manager or director within St. Joseph Heath. She is also very involved with her church and hopes to set an example for her daughters. Cynthia credits TSJ to being a support system for her in that the staff calls and checks on her monthly. There are times she gets frustrated because she has two children and no support at home, but then she remembers all that TSJ has helped her overcome and thinks, this is nothingI have faith in God that just like he has pulled me out of every other situation and provided for me, He will do the same now and in the future." If you or someone you know has reentry success story, please fill out this form and return to info@ocreentry.com to be featured on our website. Please note OCREP is not a service provider and does not directly support any organization, policy or opportunity. OCREP does not validate or endorse any link, agency or opportunity.